The quaint coastal town of Claridge, Maryland thrives on the safe, tranquil and abundant waters of Chesapeake Bay. During their annual Independence Day celebrations, a gruesome plague is unleashed, quickly infecting the residents and turning them against each other. Just when you thought it was safe to go back in the water, you find out you can’t even drink it. Veteran Hollywood blockbuster director Barry Levinson (Diner; Good Morning, Vietnam; Sleepers) brings a rare pedigree to the horror genre utilising a variety of footage formats – from mobile phones, TV reports and CCTV to 911 recordings and web cam transmissions – to deliver what the press release assures us is "a realistic and totally believable shocker." Totally believable? That'll be the day. We've not seen it yet (and it's so rare to find a found footage horror these days...), but Roger Ebert had this to say: "Although there are some scary moments here, and a lot of gruesome ones, this isn't a horror film so much as a faux eco-documentary." FearNET also rather liked it, suggesting that "The Bay is "modern" in presentation, old-school in attitude, and rather well-crafted throughout." Am I the only one who thinks the title sounds like it belongs on a biopic of the dreaded Michael? 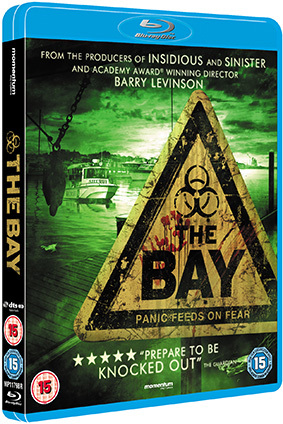 The Bay will be released on UK Blu-ray and DVD on 18th March 2013 by Momentum Pictures at the RRP of £15.99 for either disc.